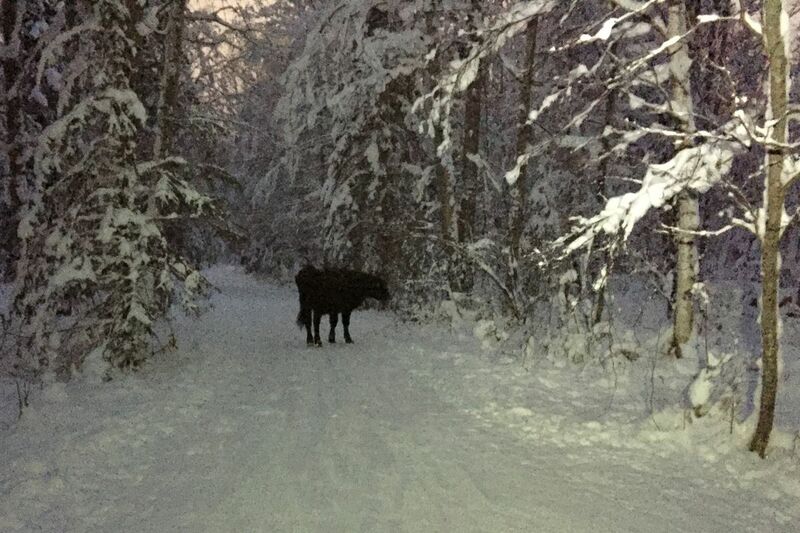 Starting last fall, bikers and other trail users began spotting an awfully strange-looking moose on the trails of the Anchorage Hillside. Some posted photos to Facebook of a dark, decidedly bovine figure amid spruce trees and packed snow. Was that a ... cow? Her name is Betsy and her owner would like her back. As of Sunday, she’s been eluding capture on the trails of Alaska’s biggest city for six months. “I know deep down this cow doesn’t want to be caught,” sighed Frank Koloski, a rodeo promoter and the owner of Betsy. It all began at Anchorage’s annual Father’s Day weekend rodeo at the William C. Chamberlin Equestrian Center on Abbott Road. The 3-year-old, 600- to 800-pound cow had been scheduled to participate in junior rodeo events. But she “busted out” of a pen and “pretty much beelined it up to the Hilltop Ski Area," said Koloski, an affable Florida transplant who has lived in Alaska for more than 25 years and who was once gored by a steer at his own event. Betsy was spotted grazing on the grassy slopes of the ski area during the summer. When the snow fell, she moved to the network of trails that crisscross the Hillside, Koloski said. She’s been spotted everywhere from Campbell Airstrip Road to Abbott Road. Cross-country skiers, runners and especially fat-tire bikers have encountered her. Betsy has become something of a celebrity on Anchorage fat-tire biking Facebook groups, where people have posted about their encounters with her. Koloski says he’s spent “hours, days probably” out searching for the cow, with a rotating cast of friends and helpers. But they’ve never caught up to Betsy. The Anchorage Police Department, animal control authorities and Bureau of Land Management have all been helpful in relaying information about the cow’s whereabouts, he said. On social media, some people have made jokes about hunting the cow (which is illegal) or about “free steaks,” which makes Koloski nervous. Well-intentioned people have tried luring the cow with food, Koloski said. That’s not a good idea, he said. He asks that anyone who encounters Betsy the cow immediately text or call him at 907-748-7336. Specific coordinates or a location pin drop on a smartphone is best, along with which trailhead to use to access the spot. Part of the problem is how good Betsy has it in the forests of the Hillside, he said. There’s still plenty of grass in tree wells, where the snow hasn’t touched. Sources of fresh water are available. Koloski isn’t surprised the cow survived the summer and fall sharing territory with an active population of black and brown bears. He thinks she spent her time in places where bears were not. In rural areas, it’s “nothing uncommon” for a cow to be “free-ranging” around, he said. “City folk aren’t used to that,” he said.